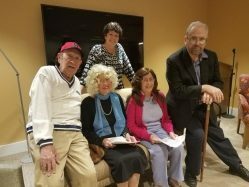 At the suggestion of one of our residents, a former actor, the Springhouse Players drama club was introduced this past summer. The club began with 14 members with different ideas on how the group would function. They ultimately decided that a play would be performed with script in hand eliminating the pressure of learning the lines by heart. Five members of the club were cast for the Players’ debut production, directed by JoAnne Faer, Springhouse’s Independent Living Activity Coordinator. “Impromptu” by Tad Mosel was performed mid November. Signup for our newsletter to receive via email the latest news and events happening at Springhouse.